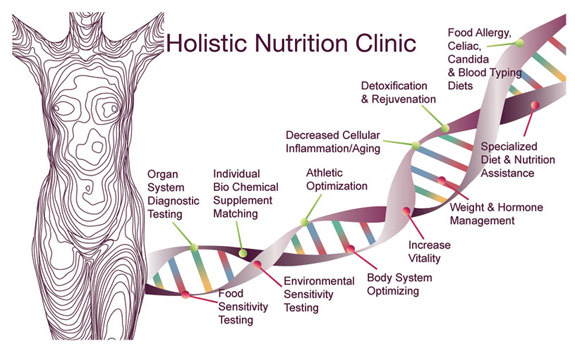 Food, Allergy & Organ Sensitivity Testing by Certified Clinical ElectroDermal Practitioner. Did You Get Your 9 Servings of Plant-Based Colors In Your Diet Today? ﻿The brightly colored pigments or different colors of fruits and vegetables are the richest sources of protective phytonutrients you can feed your body. These phytonutrients can help protect you against certain diseases. Different colors of fruits and vegetables can help protect you against certain diseases. Increasing the number and variety of plant-based colors in your daily diet may be able to improve your health. Good nutrition is the foundation to good health. What are phytonutrients or phytochemicals? These are compounds present in plants that make the plants biologically active. They determine the plants flavor, color and help the plant to resist disease itself. Researchers have identified thousands of these phytochemical and their beneficial properties in plants. The various colored fruits and vegetables are divided into five broad color groups. Each of these color groups has a different set of beneficial phytonutrients (healthful properties) or different pigments: red, orange-yellow, green and blue-purple, and white. Fruits and vegetables are naturally cholesterol-free, can help natural weight loss, low in fat/calories and high in fiber, vitamins, minerals and other phytochemicals. Researchers have recognized the health benefits for many years that diets high in fruits, vegetables, grains and legumes can provide. There has been over 200 studies that link lower cancer risks with a diet high in fruits, vegetables, grains and legumes. They regularly are reporting new health benefits associated with fruits and vegetables almost daily. Studies have now found more specific health conditions benefit from a diet high in fruits, vegetables, grains and legumes. It appears to reduce the risk of a number of diseases including, high blood pressure, diabetes and heart disease. More recently it was discovered that the disease preventing effects are partially due to various antioxidants, specific vitamins, minerals and enzymes that prevent disease by preventing cell damage that are contained in them. Nutrition experts suggest increasing the number and variety of plant-based colors in your daily diet; try to aim for nine total servings of fruits and vegetables daily. The natural red colored plant pigments in these are called lycopene and anthocyanins. Lycopene is found in tomatoes, dried tomatoes, tomato juice, tomato based vegetable cocktail, tomato paste, sauce, homemade ketchup, watermelon and pink grapefruit. Studies have said it may help reduce risk of several types of cancer, especially prostate cancer. More Lycopene is absorbed from cooked tomatoes than raw. Lycopene is also considered a carotenoid. Tomatoes also contain vitamin E another important antioxidant. 2 medium tomatoes contain 3 iu's of vitamin E.
Vitamin B3 is found in tomatoes and is important for nervous system, circulation, carbohydrate, fat and protein metabolism, digestion, lowering cholesterol, hormone production and for memory mood problems. Anthocyanins or pronthocyanins (catechins) which are the flavonoid (4-oxy-flavonoids) flavonoids actually were designed by nature to prevent environmental stress on the actual plant itself. Bioflavans are also responsible for the red/blue colors found in red fruit like cherries, cranberries, strawberries, raspberries, pomegranates, rose hips, currents, gooseberry, chilli or Thai peppers, loganberries, huckleberry, red grapes and red apples. They are found in the fresh fruit as well as their skin. Flavonoids seem to modify the body’s reaction to compounds such as allergens, viruses and carcinogens. They are known to have anti-inflammatory, anti-allergic, anti-viral and anti-cancer properties. They have found over 4,000 of these flavonoid compounds. They prompt very strong vitamin P activity. These compounds may strengthen capillaries, blood vessels in the skin, circulatory system and in our eyes. They also increase the vitamin C recirculation and up take and help fight free radical damage and support joints. They also have a very beneficial effect on collagen and help inflammation. What are free radicals? Free radicals are highly reactive molecules that destroy cellular components in the body. Free radical damage is what makes us age, and are liked to many diseased in the body. Environmental free radical like smoke, pollution, chemicals deplete these antioxidants in our body. However, the antioxidants from plant foods we consume can protect our body and cells from these harmful elements. Helpful antioxidants that can help to prevent aging and disease that are found in fruit vegetables include vitamin E and C, Selenium, zinc, beta-carotene, sulfur and flavonoid compounds and various enzymes. Examples of these red vegetables are beets, red cabbage, red peppers, red potatoes, red radish and rhubarb. Rhubarb is even high in vitamin B3, 1 cups gives you 80 mg.
Their properties act as powerful antioxidants that protect cells from damage. Studies have linked antioxidants help with keeping our hearts health, and help prevent some cancers, cellular damage, eye damage and to help aging. Another important nutrient found in red fruits and vegetables is zeaxanthin, it is found in red peppers and red grapes it can help keep eyes healthy. Apples are rich sources of magnesium, which is helpful for moods, muscles, sleep and cardiovascular health. It also assists in potassium and calcium uptake. Berries like strawberries, radish and rose hips are all plants that are high in vitamin C content. Vitamin C is a very important antioxidant which is required for more than 300 body functions such as helping stress and immune function. It is excellent for preventing some free radicals which age us! The natural orange and yellow colored plant pigments called "carotenoids." They are in the vitamin A family of beta-carotene. There are some 563 different helpful carotenoids and taking these in combination like foods have been found the most beneficial. They are precursors to vitamin A, that is, they converted to vitamin A. These can be found in sweet potatoes/yam, corn, yellow peppers, banana peppers, and yellow and orange tomatoes, pumpkins/squash/yellow squash, cayenne, and carrots which is converted to vitamin A. Vitamin A helps maintain healthy mucous membranes and healthy eyes. Scientists have also reported that carotenoid-rich foods alpha-carotene and beta carotene can help reduce risk of cancer, heart disease, free radical damaging and some of its effect on aging, cataracts, age-related macular degeneration and may even protect DNA damage. They may be good for your heart and help with high cholesterol. Vitamin A and can improve immune, night vision, bones, hair, skin and teeth system function. 1/2 Cup of dried apricots gives you up to 8,000 iu of vitamin A. 1 medium Carrot raw can give you up to 10,000 iu of vitamin A.
Vitamin B3 is carrots, and is important for nervous system, circulation, carbohydrate, fat and protein metabolism, digestion, lowering cholesterol, hormone product and for memory mood problems. Fruits that are high in these properties are apricots, yellow pears, cantaloupe, peaches, nectarines, tropical fruit such as mangoes, pineapple papayas. Different colored vegetables, fruits and herbs that have good amounts of vitamin A and vitamin C are asparagus, beet greens, broccoli, dandelion greens, red peppers, spirulina, alfalfa, chickweed, fennel seed, hops, lemon grass, parsley peppermint, red raspberry leaf, rose hips, watercress and many more. Another important types of carotenoids that are known as xanthophylls these include beta-cryptoxanthin, canthaxanthin, lutein and zeaxanthin and the limonoids which are found in orange/yellow fruits and vegetables. Zeaxanthin is found in corn and oranges and can to help keep eyes healthy. Cryptothanxin which is found in oranges, peaches, papaya and nectarines, which provide beta cryptothanxin which is help for the heart. Lutein, and zeaxanthin were found to be the most effective xanthophylls in the J. M. Seddon study for patients with macular degeneration and for patients with other eye diseases. Some foods that contain high amounts of these are collard greens, kale, mustard greens and turnip greens. Orange and yellow colored citrus fruits like oranges, grapefruits, lemons, tangerines, kumquat and mandarins have a high vitamin C content rather than vitamin A.
Vitamin C is known to help keep bones, teeth, skin, heart and immune systems healthy, pollution, fight infection, detox heavy metals, help bad cholesterol to go down and help to good cholesterol to go up. It is essential in forming collagen, protects against abnormal blood clotting, reduces bruising, may reduce cataracts and promotes wound healing and decreases inflammation. A regular size orange or grapefruit contains approximately 100 mg of vitamin C. The simple vitamin C is a antioxidant that is required for more than 300 metabolic functions in the body and is needed to metabolize folic acid and other important amino acids we need. Naural Orange juice is even a good source of vitamin B 5, 1 cup gives you 45 mg of vitamin B5. It also contains other B complex’s like inositol 1 medium g orange has 400 mg of this and a medium grapefruit has 500 mg. It is important food mood, hair growth, liver detox, cholesterol reduction and the brain. Legumes and lentils also have the B vitamin Biotin. 1 cup lentils provide 25 mcg of biotin which is important B vitamin for hair, muscles and skin. Flavonoids found in citrus fruits and berries are known to help prevent cancer-causing hormones from latching onto the body’s cells in the first place. Before they harmful free radicals in our environments can cause damage. The red/blue colors are colored by natural plant pigments called anthocyanins. Anthocyanins in blueberries, grapes and act as powerful antioxidants that protect cells from damage. Anthocyanins or pronthocyanins are a flavanoid. These flavonoids actually were designed by nature to prevent environmental stress on the actual plant itself. They are also responsible for the red/blue colors. The well know blueberry is rich in bioflavonoids, and taking up to 8-10 once a day have been helpful for all types of vision problems. 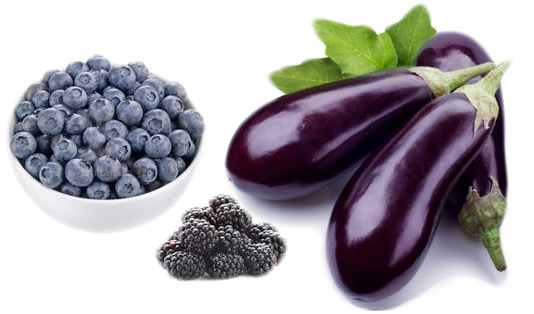 It is a relative of European blue berry of bilberry, which has many studies related to its benefits for eyes. The red/blue colors which contain anthocyanins or pronthocyanins and flavonoid may help reduce risk of cancer, arthritis, stroke and heart disease. Other studies have shown that eating more blueberries is linked with improved memory function and healthy aging. 1 medium dried date may provide 2500 mcg of folic. Folic is one of the B vitamins important for blood, glands hair, liver and pregnancy. 1 cup of cooked prunes provides 2 mg of vitamin B 6, which is important for blood, muscles, nerves, cardiovascular health, water retention and the brain. Some of these purple red fruits even provide a good source of some B vitamins Elderberries are good source of vitamin B5, just 1 cup of elderberries gives you 82 mg of vitamin B5. This is important for nerves, skin, glands and the digestive system. Green fruits and vegetables have several important nutrients such as chlorophyll, Lutein, indoles and are rich in the B vitamins. The natural plant pigment called chlorophyll, which is found in some members of the green leafy fruits and vegetable group, including spinach and other dark leafy greens, mixed greens salad leaves, green peppers, peas, cucumber and celery. Dark leafy greens and broccoli are rich in lutein, which is another carotenoids that is under investigation as a possible anti cancer nutrient. It works with other chemicals to help reduce risk of some cancers and cataracts and age-related macular degeneration, which can lead to blindness if untreated. Green leafy vegetables also contain vitamin E another important antioxidant. It is known to be linked to cancer prevention and cardiovascular disease. Vitamin E is important for blood vessels, improves circulation, tissue repair, promotes normal cataracts, helps leg cramps, may help blood pressure nerves, lungs, heart and glands and has been found to help athletic performance. The oils from vegetables are good sources of vitamin E and so are whole grains, nuts, seeds, legumes, brown rice, corn, kelp, sweet potatoes, watercress, wheat germ, flaxseed dandelion and alfalfa. Green veggies such as broccoli, brussel sprouts, kale and bok choy are rich in cancer-blocking plant chemicals like sulforaphane, isocyanate and indoles. These have been found to help inhibit the action of carcinogens. They to help activate the enzymes in our body’s various cells to prevent cell damaged to them. Indols are beneficial due to their ability to boost immune activity and make it easier for our body’s to excrete toxins. The "indoles" in broccoli, cauliflower, cabbage and other cruciferous vegetables may help protect against some types of cancer and arthritis. D-glucaric acid a photochemical found in broccoli, brussel sprouts and cauliflower. In several clinical studies it has been found to reduce the incidences of cancers of the breast lung, liver and skin. Leafy greens like spinach and broccoli are also excellent sources of folate, a B vitamin that helps reduce risk of birth defects and helps keep our hearts healthy. 1 cup of steamed spinach may contain as much as 448 mcg of folic. Folic is one of the B vitamins important for blood, glands hair, liver and pregnancy. Vitamin B1 is also found in brussel sprouts, peas, spirulina, parsley, alfalfa, watercress and broccoli. It is important for brain, ears, heart, hair, eyes and the nervous system. Important for blood formation, circulation, carbohydrate metabolism and digestion .It is an antioxidant beneficial to help with aging and cell damage from free radicals. 1 cup of brussel sprouts provides 2 mg of Vitamin B2, which is important for eyes, hair, nails and skin. Good sources of vitamin B2 can also be found broccoli, avocado, dandelion greens, leafy green vegetables and watercress. It is important vitamin to help with cataracts and eye fatigue, red blood cell formation, digestion and metabolism in pregnancy and growth. B 2 also helps absorb iron and vitamin B6 and for your body to use other B vitamins like B3. Vitamin B3 is found in broccoli, dandelion greens, carrots, tomatoes, potato, alfalfa and parsley. Important for nervous system, circulation, carbohydrate, fat and protein metabolism, digestion, lowering cholesterol, hormone product and for memory mood problems. Fresh veggies and legumes are good source of vitamin B5, just 1 cup of cooked gives you 25 mg of vitamin B5. B5 is known as the anti-stress vitamin. This is important for nerves, neurotransmitters, skin, glands, hormones moods, fatigue, formation of anti-bodies, and aids in vitamin utilization. It helps to covert fats to carbohydrates and protein into energy and aids the digestive system. Spinach and broccoli contain vitamin B6. 1 cup of peas provides 2 mg of B6. which is important for blood, muscles, nervous system and brain functions .It helps with water retention, sodium and potassium balance, promotes red blood cell formation, RNA and DNA instruction. Many studies have shown its importance in cardiovascular health by helping to control homo-cysteine levels. B12 is supplied by alfalfa, kelp and spirulina. It is important for heart, nerve, brain and energy. It aids folate in forming red blood cells and iron utilization. It is needed for carbohydrate and fat metabolism, protein synthesis, absorption and digestion. It is not commonly found in most other fruits and vegetables. Vitamin C is also found in many green fruits and vegetables such as avocados, limes, brussel sprouts, swiss chard, dandelion and mustard greens, turnip greens, broccoli, watercress, green peas, asparagus and spinach. Other green veggies to choose from in the green family are artichokes, Zucchini, sprouts such as sunflower or alfalfa sprouts, green beans, green onions and various types of lettuce mixes, kale, endive, escarole, collard greens and beet greens. There are lots of great green herbs to use in your cooking and salads such as parsley, fennel, dill, cilantro, basil, peppermint and other green herbs. Don’t forget your good fats! Remember avocados. Green fruits include green apples and grapes, kiwi, limes and honeydew melon. White fruits and vegetables are colored by pigments called "anthoxanthins." Some contain health-promoting chemicals such as allicin, which may help lower cholesterol and blood pressure and may help reduce risk of stomach cancer, tumors and heart disease. Allicin is a well known compound in garlic. They are also found in green, white, red, and yellow onions, chives, and leeks. 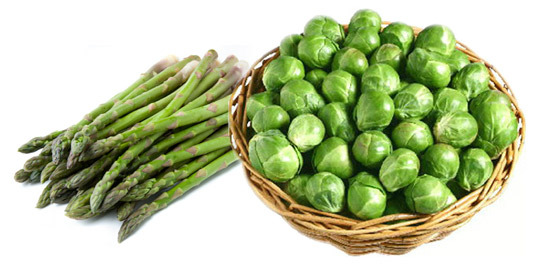 Sulfur containing foods are especially beneficial in the treatment of arthritis such as Brussel sprouts, garlic, onions and cabbage. So are the properties in ginger for helping with some of the symptoms such as inflammation. Some members of the white group include ginger, potatoes, celery, turnips parsnips, celery, plantain, horseradish, cauliflower, bananas, parsnips, pears, quince, okra, sauerkraut, rutabaga, cabbage, Chinese cabbage and mushrooms. Phyto-estrogens which may have many health benefits, including for those with arthritis and especially for symptoms in menopause. These are founding many light or white colored foods such as soy beans, fennel, nuts and whole grains. 1 cup of soy beans provides 120 mcg of the B vitamin Biotin well known for hair muscles, nails and skin. It also provides other B vitamins such as Choline important for hair, kidney, liver and glands. Genistein found in soy beans may provide protection from tumor formation. Peanuts are one of the rare vegetable foods, which have Coenzyme Q10, it a super antioxidant. It has positive immune systems effects, and found to be an anti-cancer agent, important for heart and circulation, helps cell damage and aging. Saponins found in kidney beans, chickpeas and lentils may help prevent some cancer cells from multiplying. Onions and their family are also a good source of vitamin C.
What is organic? In context of food farming, the term organic, means that the produce was grown without the aid of synthetic chemicals, which include pesticides and fertilizers. Why are organic foods better? They do not contain pesticides and decrease accumulated pesticide residue in our environment.They can have increase nutrients due to the use of natural fertilizers, which come from animals who eat vegetable matter, that contain vitamins and minerals. Why are pesticides bad for our health? Pesticides have been linked with increased cancers & increased respiratory problems in some farming communities. Scientists have found that some chemicals present in pesticides residues cause increase birth defects, sterility,tumors,organ damage & injury to the central nervous system.That is why historically as studies increases on them, they are banned. Other countries are still using these banned pesticides. That is why local and organic produce,animals & dairy products are so important.Seasonal local choices are always the freshest! Who is most at risk? The danger of exposure to pesticides through food depend on what type of chemical is used. How concentrated it is and how frequently the food item spayed is consumed.The use of multiple chemicals on foods can accumulate. The degree of danger this poses depends of the individuals present toxic load, their health, age & increased concentrations in pregnancy and breast feeding to our offspring, can make this more harmful. Why are some foods more important to eat organic? Some crops are more heavily treated with pesticides. Pesticide residues have been found on more than 70% of produce. Foreign countries who have lower standards for health protection than North America, have even worse allowable dangerous sprays they use.Some foods we eat daily,so the chemicals accumliate in us. 1. Baby Food Infants are more sensitive to pesticides because they are still developing their immune & nervous systems & are more sensitive to potential neurotoxicity & damage. 2. Milk & Butter Due to the fact chemical, pesticides, DDT,DDE,PCB & PCP molecules are stored in the fat of mammals and continue up the food chain to us. These concentrate in our body as we consume them & their chemicals are stored in our fat. They are hard to excrete after they are consumed.They mimic estrogen in the body and have been linked to low sperm, cancers of men & womens reproductive system and can cause hormonal imbalances. 80% of all cows are treated with growth hormones & antibiotics. These chemicals may take over 10 years to even breakdown in our environment after they are used. 3. Sea Vegetables: Spirulina, Kelps & Algae and Chlorella.These nutrient rich foods contain algin. Algin can bind or attract various metals and radioactive particles as they grow in nature or after we consume these, which can detoxify harmful elements in our body. If they come from a polluted sources they can be a concentration of toxins instead of detoxifying us. Go with clean sources, such as fron the north Atlantic or maritime provinces' harvested kelp, seaweeds and alga. Those grown on land/grown in the dessert covered over such as Earthrise brand spirulina & chlorella are great clean alternatives. 4. Protein Foods: Eggs (factory farmed increase spread of bacteria, disease, hormones & antibiotic content). Seafood (many estuaries & bodies of water are polluted with high levels of mercury and PCBs. There is the potential to consume farmed fish with increased disease, hormones & antibiotic content). Meat (diseased packs, hormones & antibiotic content). 5. Purified Water Reverse osmososis is a good choice,or distilled. 1990 Consumer Reports analysis suggested the 3 worse water pollutants we have in our water was lead, radon & nitrates. ATSDR Toxic Substances Registry list included concerns with lead, arsenic, mercury, vinal chloride & PCB's in water supplies. 6. Fruits: Strawberries (70% have pesticide residues, one of the highest sprayed crop per acre). Bananas (baby's 1st food, highly sprayed,commly consumed daily). Peaches,cherries & other stone fruits (70% still contain pesticide resides).Apples(48 different pesticide residue found, commly consumed daily) .Grapes 70% from Chile have sprays). Melons (76% from mexico still have residues).Raspberries (atleast 5 different pesticides used). Tropical fruits (Imported produce from foreign countries who have lower standards for health protection than North America have even worse allowable dangerous sprays,ie DDT). Buy local to know where it came from and support you community and it's future local food supply.Seasonal local choices are always the freshest! 7. Vegetables: Bell peppers (higest level of neurotoxins found). Leafy greens (systemic pesticides which can not be washed off).Spinach(endocrine, systemic, distruptors &carcinogens pesticides found sprayed).Green beans (heavily treated including with endocrine distruptors found sprayed). Tomatoes (30 different pesticides found). Cucumbers (2nd highest level of carcinogens pesticides).Celery(not consumed ofen, but has more pesticides than any other crop). 8. Grains: Rice (conventioanl & foreign farms are still highly sprayed,with dangerous herbicide 2,4,5T,which still found on samples). Corn(excessively sprayed).Oats(over treated). Wholewheat(more than 90% of samples had pesticide residues). 9. Beverages: Coffee (sprays not always burned off when roasted, may came from foreign countries with less strick pesticide bans). Wine (grapes are commonly treated with pesticides, chemicals & sulfates which can act as an allergen). 10. Nuts:Peanuts (have an allergic fungi) and nuts including almonds and peanuts are highly sprayed especially.